Peter Broderick » Blog Archive » the group! The Group is a loosely-knit collective of musicians based around Peter Broderick, Casper Clausen (Efterklang), Francesco Donadello (Giardini di Mirò), Martyn Heyne and myself (Greg Haines). The idea is to perform in an informal, casual and completely improvised way – the music has no “style” and anything goes: other musicians passing through town may join us, members of The Group may take the opportunity to try out new material or ideas, songs may stop and start and be discussed halfway through, band members may leave the stage for a while and relax for a bit. This is more a glimpse into the creative process, or the idea of building something out of nothing, than presenting polished songs for an attentive audience. You are welcome to come and drink a beer and just let us play on in the background until we latch onto something and the music begins to take shape – I am sure there will be some boring moments, but I am also sure there will be some moments of pure magic! Ultimately, it’s all about participation, but it’s entirely up to you how you wish to participate. and you can expect plenty of surprise guests as well! brrrrrr . . . it’s really cold in berlin. 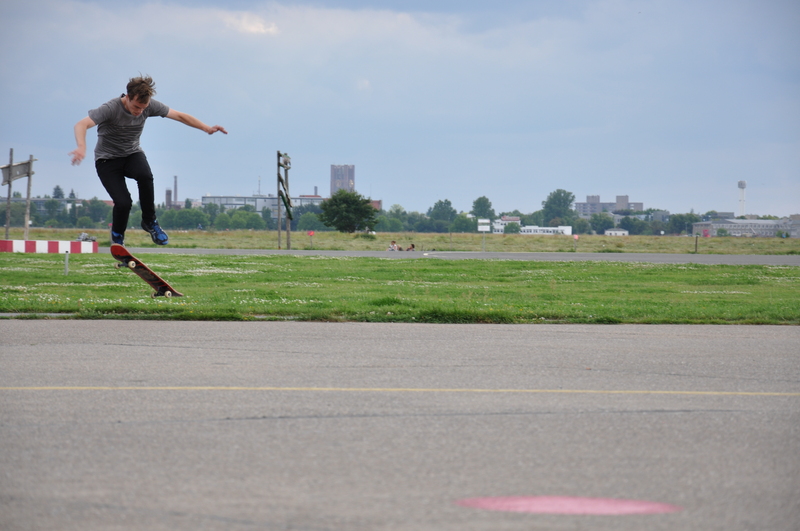 dreaming of summer days, skateboarding at the airport. This entry was posted on Tuesday, January 22nd, 2013 at 4:17 pm	and is filed under News. You can follow any responses to this entry through the RSS 2.0 feed. You can leave a response, or trackback from your own site. wow! that sounds very fascinating! i wish i could go see ‘the group’!! all the best for your new project! you got to the point, you guys with the group, really true thing! oh it was great!! we hope to do more shows around berlin throughout the year. Being a huge fan of Efterklang, I just discovered this new project of yours. I’m planning to visit some friends in Berlin around April, is there a chance to catch you there playing? P.s. : The website linked contains some pretty good pics of your memorable show on the A38 boat in Budapest, Hungary. fortunately I was able to participate in some of the rare but wonderful moments to enjoy the group. I remember very good the summer day … I believe it was the second time the group was live to see in Berlin … where I enjoyed your performance at the Warschauer Straße. To be honest I am very sad that you did no longer participate in the group … why ever … and what is even more sad is the fact that you are no more to see / listen here in Berlin for a very long time. What changed that you are no longer with the group and in Berlin to see? When my status is right even the group is no more existing or is simply no more to listen in public … both is very sad. Is there a chance for better days?